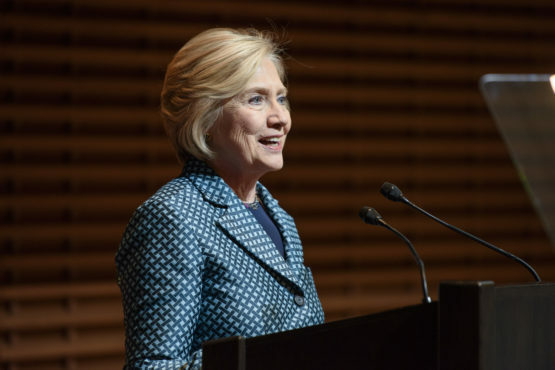 In her address to members of the campus community, Clinton spoke about Russia’s involvement in the 2016 election and celebrated Stanford’s efforts to combat cyber warfare. An attack on the technological infrastructure of the United States is akin to an attack with conventional weapons, former Secretary of State Hillary Clinton told a Stanford audience on Friday. Clinton spoke about cybersecurity and the perils of digital technology as part of a day-long conference that launched the Global Digital Policy Incubator, a new program at the university. She delivered a keynote address, “Digital Technology, Diplomacy and Democratic Values,” and spoke with Eileen Donahoe, executive director of the Global Digital Policy Incubator, at CEMEX Auditorium before a packed crowd of students, faculty, staff and guests. Clinton praised the idea for the incubator, created at Stanford’s Center on Democracy, Development, and the Rule of Law in the Freeman Spogli Institute for International Studies (FSI). The new program aims to foster collaborations to inspire policy and governance innovations that reinforce democratic values, universal human rights and the rule of law in the global digital realm. Of course, the mainstream media ignored this important speech. And she wasn’t just speaking about election interference. You know she’s very concerned about the stories of Russians mapping our electrical grid.